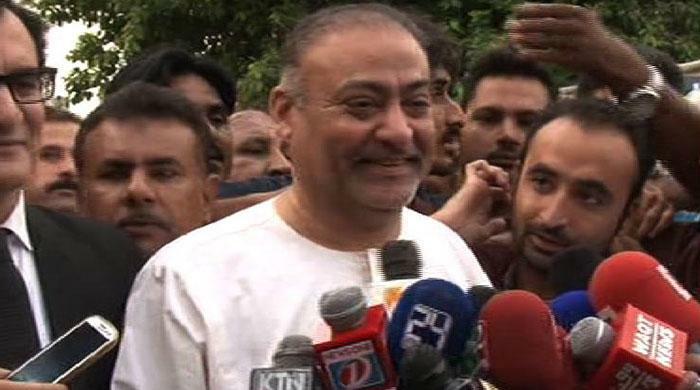 KARACHI: Pakistan People's Party (PPP) leader Abdul Qadir Patel presented himself for arrest at the Boat Basin police station on Tuesday evening, saying he did not flee from the anti-terrorism court (ATC). Patel’s arrest came hours after an anti-terrorism court turned down an extension in the bail plea of the PPP leader, who faces charges of allegedly sheltering and ordering the medical treatment of terrorists and hardened criminals at the Karachi hospital of former federal minister Dr Asim Hussain. Police arrested Muttahida Qaumi Movement (MQM) leaders Waseem Akhtar and Rauf Siddiqui, and Pak Sarzameen Party (PSP) leader Anis Qaimkhani from outside the courtroom shortly after the judge rejected the bail plea of the suspects in the case. Patel, however, reportedly fled from the scene. Speaking to media after arriving at the Boat Basin police station, Patel said that he got late for the hearing of the case and, when he arrived, he saw that the entrance to the courtroom was closed. The PPP leader said he stood there for some time and left when his lawyer told him that the ATC had turned down his request for extension in bail. He added that he left the ATC thinking of his next step to secure bail extension. "I didn't run away, I just moved out calmly," Qadir Patel said, adding that he had come for the proceedings of the case all the way from London. "Why would I run then?" When asked about contacting anyone in his party, he said that he had not yet contacted anyone, adding "Perhaps the party leaders also didn't find it appropriate to contact a worker like me". Patel said that, had he fled from the court, he would not have returned to present himself to police for arrest. "Even now, no one brought me here, I came myself," he added.